Two Aussie blokes create healthy, high protein beef jerky. Tasmania, 26th April 2018, Friends and Jerkypreneurs, Andy Fist and Shaun Malligan, who share a passion for healthy eating and the outdoors, have collaborated to shake up an often-forgotten area of the supermarket – the beef jerky section. 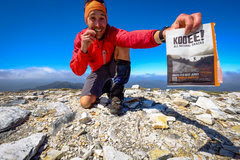 In doing so, they launched KOOEE!, which is now Australia’s leading healthy beef jerky brand. The duo wants health conscious people to know that beef jerky can be healthy. In fact, their products are enjoyed by the men’s and women’s Australian Rugby Sevens teams, elite cyclists, mountaineers, and have been fuelling adventures on every continent – even Antarctica. KOOEE! was also recently selected as one of five companies in the inaugural Chobani Food Incubator program in Australia – the first of its kind specifically tailored for food companies in the country. The founders hope to use the program to boost the company’s reach across Australia and in lucrative Asian markets, where there is high demand for Australian beef jerky products. Classic Sea Salt, Mountain Pepperberry, Smoked Chipotle and Habanero Chilli. KOOEE! is currently sold in over 500 retailers nationwide, including Woolworths (Melbourne & Tasmania), Dan Murphy’s, Virgin Australia, Paddy Pallin and Harris Farm. A pack of KOOEE! sells for a RRP of $6.95 in-store, or cheaper when you purchase in bulk on their website, www.kooeesnacks.com.au.